At the 1/10th scale Onroad World Champion Ships 1996 held at the Revelation Raceway in Montclair/Ontario, CA Team Associated came up with the idea of running a smaller car. With a wide of 210 mm and shorter wheelbase this actually was more a 1/11th scale car, similar to what Team HPI was running. But not all Associated team drivers were using this car. Also until the end of these worlds it was not clear if a regular 1/10th onroad car or the small beasts would be the better choice. In the end Mike Swauger won these 1/10 Onroad Worlds 1996 with a wide 235mm car, prepared by legendary Ron Paris. The RC10LC was kept as prototype and never went into production. 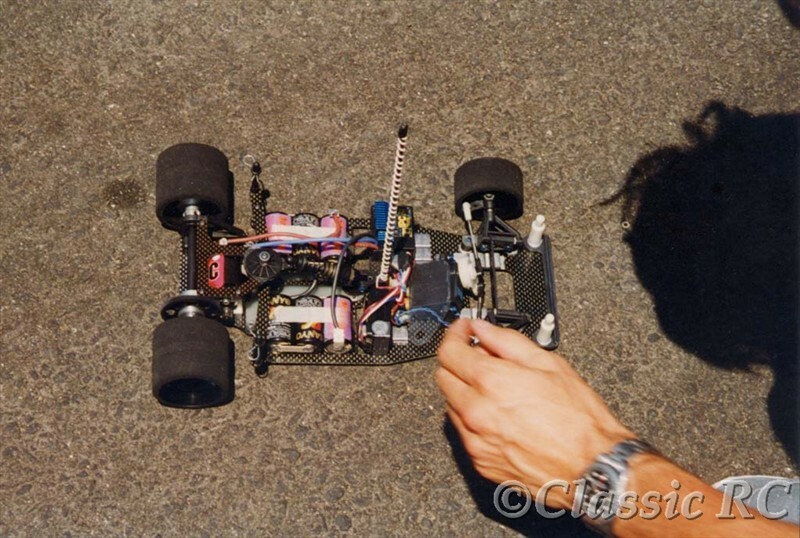 One year later a new Team Associated 235mm car was introduced, the RC10L2. This is an original 1996 analog picture digitized these days. The car is showing a R10LC prototype car after the A-Main. Update:New pictures, showing another original RC10LC car as run by a driver from Finland at the same 1996 Onroad Worlds. The first picture is showing also one of the prototype bodies made for this car and Worlds trophy. No production body could be used as the RC10LC is using not only less trackwide but also shorter wheelbase, infact the wheelbase was much shorter than any other narrow car of the RC10L series. The last picture is showing the RC10LC prototype vs a RC10L2 what was released one year later. You could see now the very different dimensions of both cars.